In my ongoing quest to find great cupcakes, here’s a recipe I clipped seven years ago from Chocolatier Magazine. 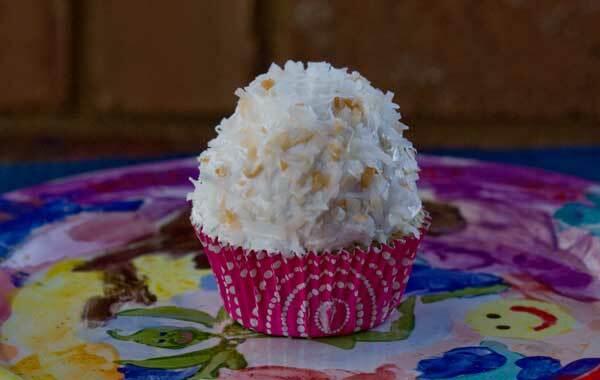 It’s called White Mountain Coconut Cupcakes, and the secret ingredient is (drumroll please) coconut milk! Not that coconut milk is really so secret. There are quite a few good coconut recipes that call for it, and for good reason. It adds richness and just a hint of coconut flavor. In addition to the coconut milk flavor, more coconut flavor comes from the coconut that’s sprinkled on the frosting. I always forget how much I like 7 Minute Icing. It’s light, fluffy, and crusts over after it’s been sitting around for a while. Plus it’s fat free, so you can pile it on generously without making things overly rich. The only problem with 7-Minute Icing is that it can be kind of a pain if you don’t have a double boiler. Setting a metal bowl over simmering water works well, but I think I’m going to try another method today from. King Arthur has a 7 Minute Icing recipe where you boil the sugar syrup to about 240 and just pour it into the beaten egg whites. Yellow cupcakes with a hint of coconut flavor topped with a mountain of light, fluffy, 7 Minute Frosting. Preheat oven to 350 degrees F. Line 12 cupcake cups with paper liners. In a mixing bowl, using an electric mixer, beat the butter and sugar for about five minutes. Add the eggs, one at a time, beating well after each egg. Add the vanilla and beat well. With a spoon or heavy duty scraper, stir in half the flour mixture. When flour is blended, stir in the coconut milk. Stir until blended, then add the rest of the flour mixture and stir until smooth. Divide evenly among cupcake cups and bake for about 22 minutes or until cupcakes spring back when touched. To make the icing, put the sugar, water, egg whites and cream of tartar in the top of a double boiler. Alternatively, you can use a metal bowl and set it over simmering water. Using handheld electric mixer, beat on high until foamy (about 1 minute). Place the top part of the double boiler (or bowl) over simmering water and beat on high speed for about 7 minutes or until frosting holds firm peaks. Remove from heat and stir in extracts. Beat another two minutes. Put large spoonfuls of icing on the cupcakes. Sprinkle generously with the coconut. To toast the coconut, lay it on a cookie sheet covered in foil. Bake at 350 for about 5 minutes or just until the coconut around the edges starts to brown. Mix all the brown coconut with the white coconut and let it cool. Just made these using cake flour this time. Good recipe! Used chocolate buttercream frosting instead. My favorite cupcakes now. Heidi, I just piled the icing on to make the domes. The cupcakes didn’t have domes, but the tops were slightly rounded rather than perfectly flat. I have not found a good domed cupcake. The ones I’ve tried all taste like muffins. Your cupcakes look awesome! Like they belong in a photo shoot or bakery window! They are so tall. Did the cupcakes actually develop a nice tall dome or is the tallness all due to the mound of icing? (which I happen to LOVE a big tall mound of icing). I think I’m going to try making these. The only thing is, nobody in my family likes coconut but I happen to love it so who will be eating most of the cupcakes?! ME!! I guess I can bring them to the office. My hubby looooves coconut – I need to make these for him! Do you know that I was searching Cookie Madness earlier today to read your coconut cake recipes? I’m hosting something here on Wednesday and can’t decide what to make. I had settled on a key lime pie here but now I’ve got coconut on the brain. These look delicious!!!! I wasn’t thinking cupcakes but then again……. Cindi, thanks for the link! I’ve been trying to post scratch recipes, but I’m not opposed to box cupcakes that taste good. Those look fun. Speaking of great cupcakes, have you seen this recipe? Yes, definitely! Hope you like them, Gloria. I love macaroons so I would love these. Not sure about the effort for the frosting though…I’m lazy! Do you think your cream cheese frosting would be good on these for a lazy-person alternative? I love coconut! These are gorgeous!